J V Crum III was a self-made millionaire in his twenties, is a licensed attorney, holds a Masters in Business Administration and an MS in Psychology. He also has nine years of studies in Neuro-Linguistic-Programming (NLP), is certified in Ericksonian Hypnosis and has training in Energy Psychology. An enterprising young man, at only 4 years old, J V became an entrepreneur in his tiny town of only about 200 people. He set up his pup tent to sell hand-squeezed tangerine juice to high school students when they got off the bus. By the time he was 5, he decided he was going to be a millionaire when he grew up. By 25, J V had realized that dream, celebrating by purchasing a new luxury home on the water, his first Mercedes, trips to Europe and more. He had the “American Dream”, but realized very quickly it wasn’t enough. J V realized that his childhood dream had not included the truly important parts of life, such as feeling a deep sense of purpose and fulfillment. For over 20 years, he searched for the answers through reading, attending programs and spiritual retreats. He sold his companies, went to Gampo Abbey, a Buddhist Monastary, then to Esalen in California, and ultimately to Boulder to live. It was in Boulder that he first saw the phrase “Conscious Millionaire” in his mind, when he saw the word “conscious” in a brochure he was reading in a spa tub. Six months later, he started a non-profit, Conscious World Foundation Inc. He trademarked the phrases, created an audio CD and began developing Conscious Millionaire and Conscious World. Also a best-selling author, J V wrote Conscious Millionaire: Grow Your Business by Making a Difference, First Million Manifesto and the Conscious Millionaire e-book series. In addition to being CEO of Conscious Millionaire Institute, LLC, J V is a Huffington Post columnist and hosts the #1 Conscious Millionaire Podcast. He’s also been featured on Huffington Post, Entrepreneur on Fire Podcast, THINK Entrepreneurship, Mixergy, Eventual Millionaire and NPR, to name a few. 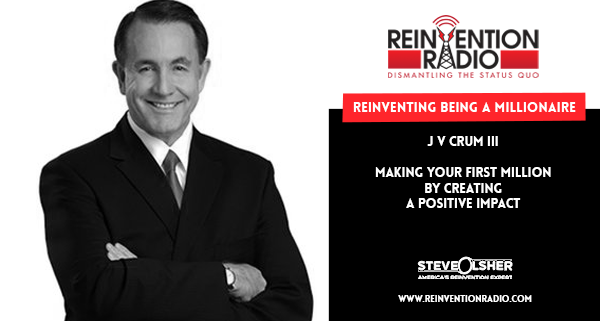 TUNE IN to this episode as J V chats with Steve, Mary, and Richard about making your first million by creating a positive impact. @jvcrum shares tips for getting to your first million. 2 – Making the journey into real life; Tips for getting to your first million; There are two kinds of people; What can people produce? Reinventing Leaders – In this episode, Joshua Spodek chats with Steve, Mary, and Richard about changing the game for leadership development and creating positive change.